The Connecticut Granger is the official newspaper published by the Connecticut State Grange. The newspaper is published monthy. The subscription cost is FREE to Grange members in the State of Connecticut, and only $5.00 a year for Grange members outside of Connecticut and non-Grange members. The newspaper is run entirely by volunteers. 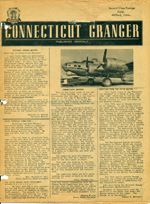 To download a special commemorative PDF file of the first issue of the Connecticut Granger, printed in 1960, please CLICK HERE. FEBRUARY 11, 2018 -- I know many of you are upset with the delivery of the January issue of the Connecticut Granger. I assure you that I am as well. Unfortunately, the weather was "Strike One" in a series of issues that caused the problem this month. PDF versions of the Connecticut Granger Report Form and Change of Address Form are now available online for download. Please note that these PDF Forms have the ability to be completed interactively. 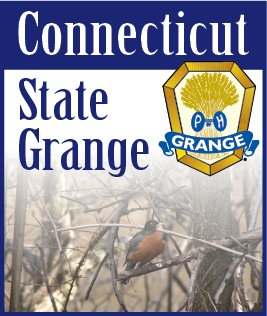 We would love to have all of the Granges across Connecticut report in every issue of the Granger. Have you forgotten to submit a report recently? Does your Grange need a correspondent? A short paragraph is all it takes to keep your members and members across the state informed of your Grange's activities. Follow this link to view a list of old Connecticut Granger issues as well as special commemorative spreads available for download as PDF files. News/Photos are due on May 15th for the June issue.